If you have a problem with MEAP simply upload this zip file (meapinfo.zip) as an attachment, along with your message, using the Support Ticket System. (Don’t forget to enter your MEAP Order Number and User Name). If MEAP fails there will usually be an option (the left hand button) to open the folder where the zip file is located. The MEAP technical support is already renowned for acting quickly and efficiently. Now it can be even more efficient. Response time is usually under 3 hours. 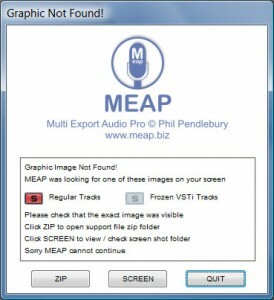 Previous post: Why use MEAP when new Cubase / Nuendo do batch export? Next post: What do I do with the new graphic files I received?